Robert Kaplinsky at robertkaplinsky.com shared this lesson idea with Yummymath. With plenty of days off from school coming up you plan to spend a day at the movie theater. You want to see as many movies as possible. 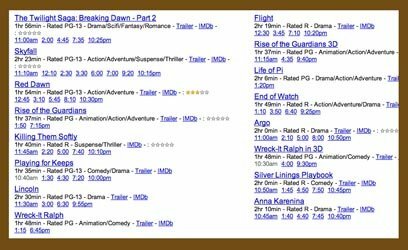 Create a schedule that shows the most movies you could see in one day. In Robert's activity, students are asked to analyze a situation, consider contributing factors, and present a logical solution. There will be many correct "answers" to this exercise. The goal of the activity is more about engaging students in problem solving (CCSS.Math.Practice.MP3 - Construct viable arguments and critique the reasoning of others) than on finding the most tightly arranged schedule.